The Guardian decided to put the ball back in the readers court. They asked readers on their Word of Mouth food blog to come up with a menu themselves to see if they can do better than the celeb chefs. Take some photos and the best ones might get published in G2. I decided to submit a Syrian inspired menu. It was such a hard task as you need to buy everything from scratch. Olive oil alone will eat up half of your budget. 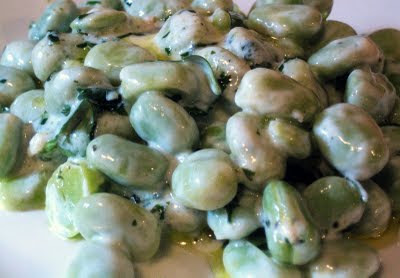 I decided to cook Foul Salad(Broad Bean) for starter. This is Foul Ma'alla ("fried" Foul) with a twist. The main is Mujaddara(Bulgar wheat and lentils pilaf). I added a non-Syrian chilli sauce to pour on top. 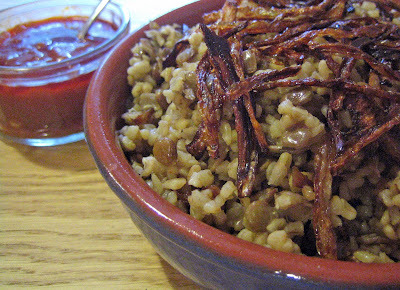 I got the idea from the Egyptian dish Kushari. For those who don't know, Kushari is a "poor man" dish consists of rice and lentils pilaf, boiled pasta, fried onions and chilli sauce on top. I personally prefer to "Syrianise" it and use Bulgar instead of rice. Boil water in a pan and add the frozen beans. Bring back to the boil and cook for two minutes. Transfer the beans to cold water to stop the cooking process and preserve their colour. In a frying pan heat two table spoons of olive oil till very hot. Drop the coriander and garlic and remove immediately from heat. This will flavour the oil and take off the edge of the garlic. Add the mixture to the broad beans and squeeze half a lemon. Mix with yogurt and drizzle some olive oil. Finely slice half the onion and fry in olive oil till brown and crispy. Remove half the fried onion and dry on kitchen paper to sprinkle on top. Keep the rest of the onion and the oil for later. Soak the Bulgar wheat in cold water for 20 minutes. Boil two cups of water on a pan and add the lentils. Let cook for 10 minutes till start to soften the add the Bulgar wheat and a tea spoon of salt. Bring back to boil then reduce the heat and cook for 15-20 minutes. Add more boiling water if necessary. Add the olive oil and fried onion mixture 5 minutes before ready and mix well. Cooking time and water amount varies a lot depending on the type and coarseness of the wheat. Try to follow the pack instructions. Cover and let steam. For the chilli sauce chop the other half of the onion and sweat over medium heat in olive oil. Finely slice the garlic and add to the soft onion. Add the tomato paste and chilli powder and cook for few minutes. Add 1 cup of boiling water, salt, vinegar and squeeze some lemon to taste. Let simmer for 15 - 20 minutes till the sauce is thick. Serve the Mujaddara with fried onion on top with the chilli sauce. The paper came out today, my menu didn't make it. Maybe, I should have cooked pasta afterall! they don't know the best taste for their tongue. First, London IS cheaper than Geneva. Those ingredients will cost much more here :( but still, this is cheaper (an much better tasting) than cooking pasta. Second, I miss Mujaddara so much. I haven't had any in very long time. I also love the rice Mujaddara by the way instead of Bulgar wheat. I suspect that you find that sort of a 'fake'! Well, with the pound this weak, everywhere is more expensive than London these days. Even Damascus is just about cheaper. Regarding Mujadara, It is not about fake. When I was a kid I wouldn't even entertain the idea of eating Bulgar or anything cooked with it apart from Kibbeh. But through the years I changed completely and now I find rice Mujadara really lakes in flavour. I agree with you Kano, Bulgar is a taste we had to grow into. I think I prefer it now. I did the Mujadara and it came out good. A little bit (Makhbousa) though. I think I freaked out in the middle that there wouldn't be enough water so I added too much... Will have to have another go at it. Hi Joy. Thanks for the nice words I am really flattered. I am more than happy for you to put my post on your facebook group. And please let me know if I can help with anything. I can try to create cheap but good and healthy recipes in the future if you want me to. Kano thanks for your generosity! I would so appreciate it if, when you have the time, you could try to follow the outline on http://home.vicnet.net.au/~yamdaisy/menu.htm to make a days menu. You could let me know if the guidelines make sense, and give me an idea of how practical they are! I really want to blend the idea of cheap basic food and special, delicious food and it is not easy! But you did it beautifully in your blog. I will try to take a look this weekend and I will let you know. Kano, please don't feel obligated. But if at some stage, when things are not too busy, you feel inspired(!!!) I would be so grateful for your input. In the meantime I am working on guidelines to be better use to those who might try. Thanks again for your interest and good will. more delicious recipes - - I have sent this to my son & his partner. My son's partner is a Veggie - she will love these recipes. 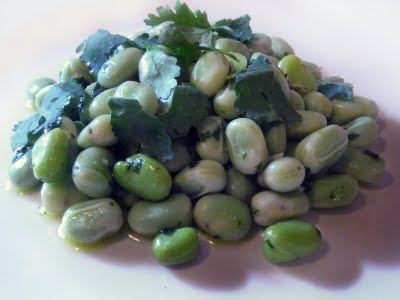 I made this last night with a load of podded runner beans that had gone over - it was delicious and so simple. Thanks for a great idea. I have to confess though, I did also add some chilli. I am so glad you liked it. There is a similar recipe in Syria that uses French beans or runner beans. I will post it. The mean difference is the use of tomatos. Thanks so much for posting this recipe. I have been on the search for this dish and have never been able to find it since I lived in NC (random, I know). I made it last night, and although I need to work on perfecting the amounts of water and oil, it still turned out so delicous. And I loved the chili sauce, which I didn't think I would like much. Thanks! Mujadara, although a very popular dish, is usually considered basic food. May be that why you don't see a recipe that often. Mjadara with chilli sauce? I will try that, usually I make a small zibdeyeh with yoghurt, cucumbers and mint on the side. This was inspired by the Egyptian Koshari and it works very well indeed. Glad you and the family liked Mujadara. I don't actually know the dish you are talking about. It sound like the Italian dish Spagetti in Arrabiata sauce. It is either a Syrianised koshari or a Kosharaised mujadara. Not sure which one. If your lentils getting too soft and mushy try cooking them without soaking and add the bulgur earlier.